Remember the Pininfarina H2 Speed concept car from the 2016 Geneva motor show? Well the big news in Switzerland in 2018 is that it's going to enter a limited-run 12-unit production run - and this is what it'll look like. How fast is the Pininfarina H2 Speed? It looks like a Le Mans car from the future, it’s powered by a hydrogen fuel cell that creates electricity fed to four electric motors, covers 0-62mph in 3.4 seconds and has a top speed of 186mph..
There’s no gearbox, clutch or diff; drive goes directly to the rear wheels, and is governed by torque vectoring software. There aren't any harmful emissions, locally at least, either – just water. Pininfarina says the compressor system ‘gives the vehicle’s engine a very special tone,’ with ‘science fiction’ hissing sounds that are reputedly quite different from conventional electric cars. 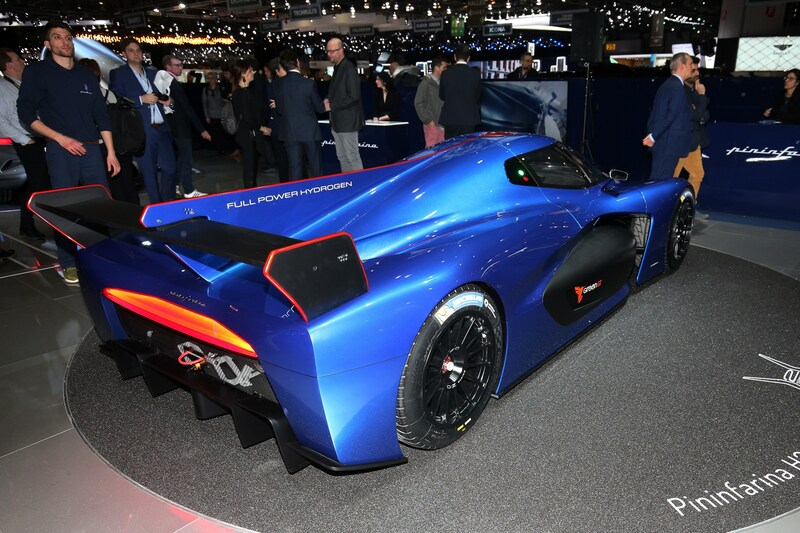 It’s been created in a technical partnership with GreenGT, a Franco-Swiss specialist electric powertrain outfit (hence the Swiss and Italian flags on the bodywork). GreenGT has spent some years developing a series of curious hydrogen hybrid racing car prototypes, and the Pininfarina H2 Speed uses a development of its tried and track-tested powertrain, clad with bodywork shaped partly by Pininfarina’s stylists and partly by the search for downforce. Carbonfibre, predominantly. You can see part of the carbon chassis through the side panels, which have been hollowed out in the name of airflow. You can also see the two large hydrogen tanks at each side, partially faired in rather than incorporated fully into the body. Pininfarina says the tanks’ 6.1kg capacity can be refilled in only three minutes. Two large radiators at the front of the channels cool the fuel cell block and the distinctive upside-down L-shaped wings at the front direct further airflow (as well as supporting the concept’s slim-line LED light strips. The car’s total weight is 1420kg, on empty tanks.